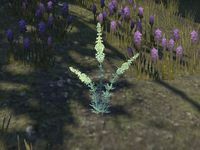 Wormwood is a fairly large green plant and alchemy reagent. It can be found growing in all zones, with the exception of Coldharbour (outside of the Hollow City). Like the other non-mushroom plants, it tends to grow out in the open. The plants have a higher than average chance of producing worms in addition to the reagent. This page was last modified on 3 February 2019, at 09:00.